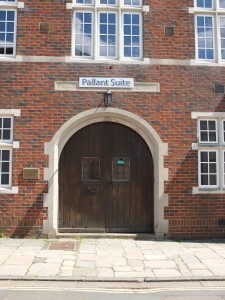 Chichester Masonic Centre, of which the Pallant Suite is part, dates back to 1970 although the building is very much older and parts date back over 300 years. Originally the building was a school but then became neglected as a furniture store until acquired by Chichester Masons. They wanted a permanent home for their lodge meetings which had been held in varying locations around the city since the lodge’s first meetings in 1750. By selling the adjoining stables money was raised to convert the building to their specific needs; this naturally included a large meeting room or temple as it is called together with bars and dining facilities. These accommodate the many dinners associated with Masonry and Ladies Nights, which are a more formal style, dinner-dance. Although four lodges and many more other masonic orders meet at the centre, this only uses a fraction of its capacity so it has been available for other organisations since its inception. The Chichester Jazz Club has made the Centre its home since 1999 with popular meetings that regularly exceed 100 members and visitors. Similarly the Local RSPB society, the Chichester Natural History Society and the Ramblers Association hold regular meetings in the main hall. The centre is regularly used for private, public and busines s events of many types as it is one of the few large halls in the centre of the city. The ground floor facilities are focused on hospitality whilst the upper floors have a distinct masonic feel which makes for an unusual and interesting venue. The Pallant Suite is that part of the Masonic Centre that is available for functions, this includes the main hall on the ground floor, the bar on the first floor and the Masters room which is on the second floor. These are all available for hire at competitive rates, either individually or in any combination.